As little girls, we were read such stories. As we grew up, we hoped for our own happily-ever-after futures. As adults, we sometimes wonder if we will ever get such an ending, or we simply wonder how our life can seem more like existence in the dungeon than living comfortably in the castle. The thing is, the fairy tales we read are just that, fairy tales. They are not really real, nor do they reveal the rest of the story. Wouldn’t it be great to find out what Cinderella thought of her mother-in-law? Or how Sleeping Beauty and the Prince survived their colicky babes? Or what Snow White thought of rarely seeing her dwarf friends, because she had royal subjects to tend to first. Or, maybe the prince, from Beauty and the Beast, let his inner beast out making Belle wonder why she ever trusted him? These dreamy stories last only long enough to whet our romantic appetites, leaving our real lives to sometimes feel like we are thirsting in the desert, rather than drinking from the fountain of love. How do we achieve happily ever after in the real world, in real life? as there is no guarantee, there is no formula, and there is no fairy godmother who can wave a wand and create a magical spell to fall upon your reality horror-program-like life. Marriage is life in the trenches of expectations, dirty diapers, sleepless nights, impossible schedules, difficult times with teens and more bills to pay than pay coming in. Add to that PMS, stress, health issues, and you have a cauldron bubbling with more stank than Shrek ever had in the swamp! A happily ever after ending does have a common foundation, though. It is that the beginning and the middle anticipate that the ending comes at the end … the end of life as we know it. It is a white knuckled determination to honour, love and stick with your prince/princess no matter what forces attack the drawbridge … even if they come from within! But it is more than that. It is not enough to simply get to the end together, but is a constant, daily pursuit of a together that goes beyond fulfilling the letter of the law, and into the deep, intimate union of body, mind and soul. In our real life relationships, we cannot expect this perfect pursuit from our prince/princess every day, but it does need to be the goal … for both parties. 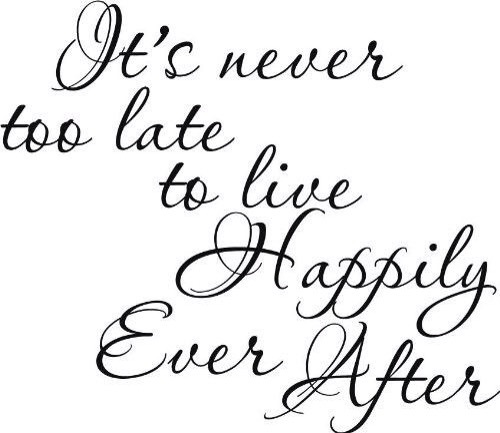 So, lets aim for that happily ever after. We might not make it to the ballroom every night, but at least we will have our gown/tux ever ready in the closet. To aim any lower is to jump for the drawbridge as it’s lifting … never sure if our feet will land safely on the other side.